As wind and rain strip colorful leaves from the trees here in Maine, here is a timely poem by David McCann, who lives in Massachusetts. David has two poetry collections from Moon Pie Press: SAME BIRD and LOST AND FOUND. Reprinted by permission; copyright 2016 by David McCann. or more simply at the end to gravity. What prepares the leaf to fall is cold. that triggers a leaf’s detachment. Study the leaf, she would say. take as a token of wisdom. 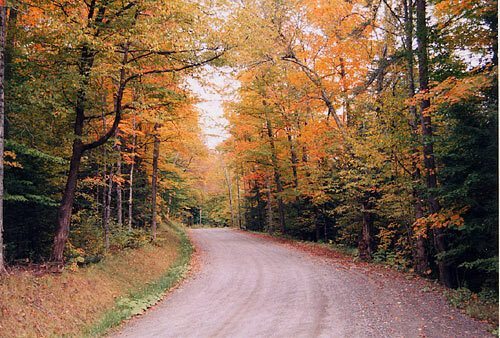 Posted in Uncategorized and tagged autumn, David McCann, fall, fall foliage, Moon Pie Press, poetry about fall, trees. Bookmark the permalink. John Clare (1793-1864), the son of a farm laborer, was a fine Romantic poet known for his celebration of the English countryside. Here is a timely Clare poem. Posted in Uncategorized and tagged autumn, countryside, English, fall, John Clare, Romantic, Romantic poetry. Bookmark the permalink. Fall affects people in differing ways. Some feel dread as the days get shorter and the temperatures drop. They worry about darkness, snow and cold when they are months away. Others, like me, love fall the best. Yep, I like all the cliched autumn things: apple picking, country fairs, turning leaves, mums and pumpkins, crisp nights, Halloween, fewer tourists in Maine….almost all of it, except pumpkin spice flavored beer and coffee. I think it’s the loveliest time to live in New England. Here is a short, powerful poem by Denise Levertov that I have liked for a long time. Posted in Uncategorized and tagged autumn, Denise Levertov, fall, Maine, New England, northern red salamander, poem, poetry, salamander. Bookmark the permalink. Autumn in New England, of course, is spectacular, but it also brings a sense of loss and drawing in, as days shorten, we finally turn the heat on, and batten down the house for winter. We resurrect our jackets, gloves and flannel sheets. The garden slowly dies. Here is one of my favorite poems about fall, bittersweet like the season. I chose this for my mother’s memorial service program in June; she liked the poem. Our mutual love of poetry (and reading) was one of our strongest bonds. This strangest autumn, mellow and acute. Love will endure – if I can let you go. 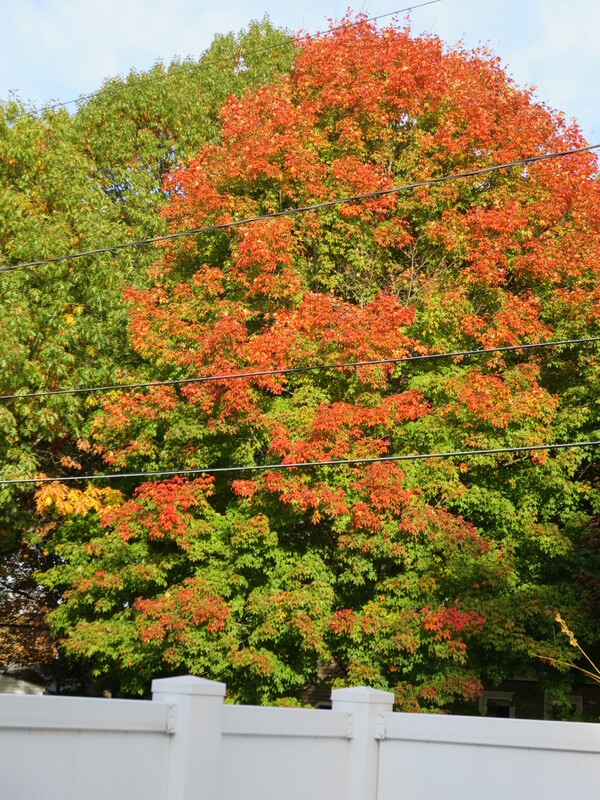 Posted in Uncategorized and tagged Autumn sonnet, fall, loss, May Sarton, mourning, New England autumn, poetry. Bookmark the permalink. This is a tree in my neighborhood in Maine. It’s a cliché but a true one that most of us feel lucky to live in New England this time of year. The “FOILAGE”, as I heard someone say on the radio, is spectacular. 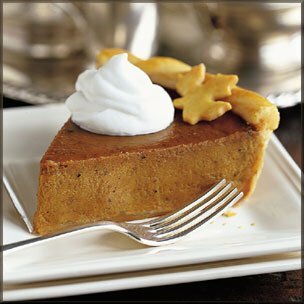 One’s thoughts turn to cooking, comfort food, approaching holidays, wearing fleece and putting the flannel sheets on the bed. And, of course, reading and other indoor activities. I read a wonderful book recently, ON THE MOVE, Dr. Oliver Sacks’ memoir. What an extraordinary man, multi-talented and in love with language. I had read some of his books about neurological patients and they were very good, but the memoir is even more fascinating, and I recommend it highly to you. Posted in Uncategorized and tagged autumn, books, comfort food, fall, New England, Oliver Sacks, On the Move. Bookmark the permalink. We’re in the pumpkin season, of course – suffering such abominations as pumpkin coffee and pumpkin beer. (Pie, bread, muffins, all that traditional stuff is great.) 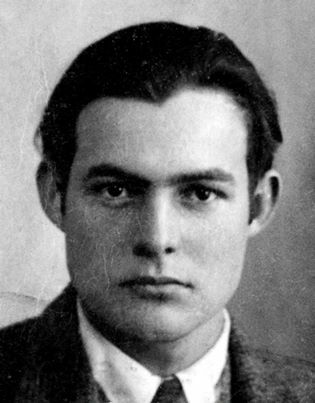 I threw in this photo of young Hemingway just because he was so handsome; that’s easy to forget when you see pictures of his older self. I am so pleased that Alice Munro won the Nobel Prize in literature. I have loved her writing for decades. Some of her stories are gritty, sad, and difficult to read; there is no one who penetrates into the hearts and minds of her characters the way she does. It’s unusual for a writer who has gone the distance to only write short stories, but obviously it’s her form. It’s about time a Canadian won, too. Wonderful quote from Oscar Wilde: “All bad poetry springs from genuine feeling.” His birthday was October 16. Posted in Uncategorized and tagged Alice Munro, fall, Hemingway, Moon Pie Press, Nobel Prize, Oscar Wilde, poetry, pumpkin. Bookmark the permalink. My window boxes are still blooming, and so is a pink rose in my yard – most unusual for October in Maine. I had to mow the lawn today – usually by October that particular chore is done until spring. 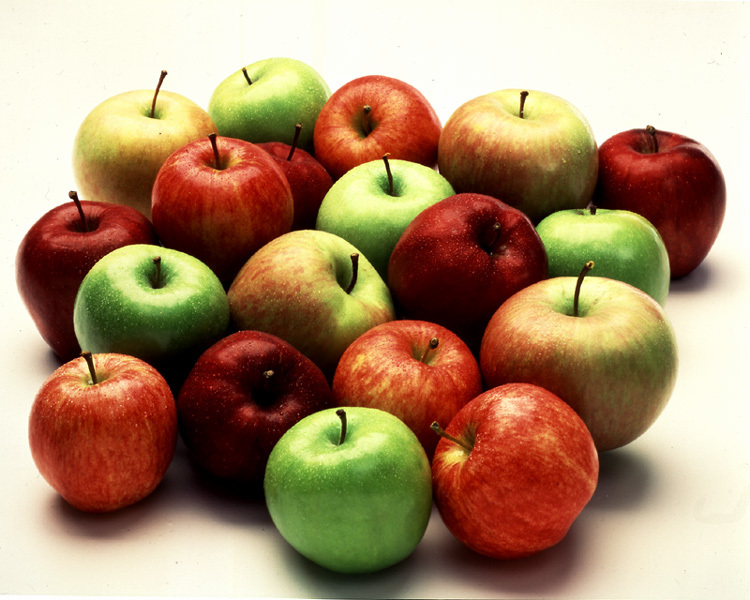 Last weekend I went to the Cumberland Fair and tomorrow I’m going apple picking. The state has officially declared the fall foliage to be at its peak. The pleasures of autumn in New England! The poetry scene here gets more varied this time of year, too, with slam, open mikes, featured poets and many kinds of readings and festivals all over the state. Maine Poetry Central and Moon Pie Press just released the first winner of the Michael Macklin Prize contest, a wonderful poetry collection by Michele Leavitt of Unity, Maine, called BACK EAST. It is already selling briskly and I am delighted. Michele will have a “launch” reading on November 1 at Longfellow Books in downtown Portland; details will be on the MPP website at http://www.moonpiepress.com. Other readings will happen, too. I hope to see you at a poetry event this season. Posted in Uncategorized and tagged autumn, Back East, fall, Maine, maine poetry, Michael Macklin, Michele Leavitt, New England, October, open mike, poetry, Unity. Bookmark the permalink.